“I think all the panelists agree on one thing: we need system change, not climate change,” Mark Underwood said to wrap things up at a panel discussion he had helped to organize. 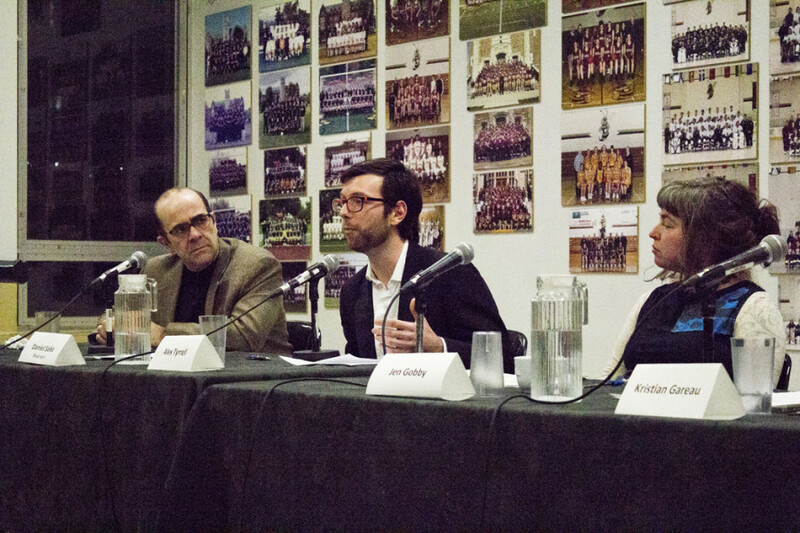 The panel called, “No Pipelines: What’s Next?” took place on the seventh floor of Concordia’s Hall building on Tuesday. Students at the School of Community and Public Affairs, including Underwood, organized the event as a class project. The talk began with Underwood’s recognition that the discussion was taking place on unceded Kanien’kehá:ka (often referred to as Mohawk) land, and that indigenous people have been at the forefront of land-defense struggles including anti-pipeline movements. The panel included the leader of the Green Party of Quebec Alex Tyrrell, Jen Gobby of Climate Justice Montreal, and Kristian Gareau from the Front commun ecologiste pour la transition énergétique. Tyrrell, who has been in charge of the Green Party since September 2013, described how the Party itself brings issues to the spotlight which would otherwise be ignored by Quebec’s mainstream political parties and media. Under his leadership, Tyrrell says the Greens have “transformed into an eco-socialist party,” and attempted to advocate for free public transit, as well as issues not directly related to the environment such as public health care. The Greens are “opposed to any new fossil fuel infrastructure in Quebec,” he added. But despite being a politician himself, Tyrrell stresses the need to pressure for change from outside the system. Gobby has focused much of her activism on the construction of alternatives to the petro-economy. She described how she lived “off-grid” for some time in British Columbia on a small island, helping to form a collective called the Mud Girls. Through trial-and-error, the collective learned about how to live in ways that are sustainable—constructing houses through freely available natural materials and living off the land, according to Gobby. She says that she takes inspiration from the Unist’ot’en, an indigenous group within the Wet’suwet’en nation who have been occupying their unceded territories and in Northern British Columbia for nearly six years now in order to block pipelines and protect the land. Gareau also stressed the importance of action, describing how he once joined members of Climate Justice Montreal and famed political pranksters The Yes Men to pose as employees of pipeline company TransCanada, at a company information session, in order to hand out anti-pipeline material to attendees. “It’s not just about pipelines, the environment, or water,” Gareau said, despite taking action against TransCanada specifically. “It’s also about the cannibalization of our political system by corporate interests.” These issues, he says, are inseparable. There are three key elements to making change, Gobby said, paraphrasing environmentalist Joanna Macy. The first is taking action to oppose the things seen as wrong. Next, new structures must be built in their place. And finally, hearts and minds—broader culture—must change. Correction: The name of the organizer quoted is Mark Underwood. It is not Mark Sottobosco. The Link regrets the error.